Moonee Valley City Council has prepared a Water Strategy (The Strategy) that demonstrates their ongoing commitment to fostering healthy communities and promoting Integrated Water Management (IWM). Aimed at Council and the community, it draws together existing Council water policies and strategies into a single coherent document. To guide decisions on sustainable urban water management, the Strategy establishes a framework supported by tools such as (1) a priority sub-catchments map which identified five main areas to implement Water Sensitive Urban Design (WSUD) projects, and (2) a sustainable water hierarchy which helps land managers consider the best water options for their site. Guiding principles of the Strategy include harvesting and re-using rainwater, protecting local biodiversity, reducing greenhouse emissions, valuing WSUD, and sharing responsibility. These principles deliver on environmental, social and economic outcomes, with a focus on making cities more resource efficient, resilient and liveable. The Strategy also includes a comprehensive action plan, which sets out detailed actions and timeframes and assigns responsibilities. This plan covers a diverse range of areas – policy and planning, community support, monitoring and maintenance. The Strategy and subsequent stormwater quality targets will be reviewed and updated annually by the Council’s WSUD Working Group. The strategy is accompanied by new WSUD guidelines that are an adaptation of the IMAP (Inner Melbourne Action Plan) guidelines tailored for Moonee Valley, produced in association with Melbourne Water. Council has also prepared a planning scheme amendment (awaiting approval from state government) that when adopted, will see broader implementation of WSUD in private developments. The key drivers for the preparation of this strategy reflect Moonee Valley’s commitment to supporting healthy communities and waterways through the adoption of IWM and the implementation of WSUD. The objective of the Strategy was to draw together existing Council water policies and strategies into a single coherent document, focusing on IWM, with a clear set of actions, responsibilities and timeframes from which progress can be measured. Council established a WSUD working group early in the development process of the Strategy, which fostered collaboration between council representatives from across a number of teams. The internal engagement process is kept alive through the induction of all new staff to Moonee Valley City Council. New employees are provided with an overview of the Council’s guiding principles for water as set out in the Strategy. This approach further demonstrates Council’s commitment to ensure the Strategy is communicated and understood, and that responsibility is shared. Council has observed that the community is embracing the actions under the Strategy and is receiving positive feedback as projects are implemented. As a result, community understanding of the role of WSUD assets has improved. Since the completion of this strategy, Melbourne Water has issued guidelines: Developing a Strategic Approach to WSUD Implementation, which should greatly benefit other councils in developing their own strategies. The key to ensuring implementation of actions in the Strategy was to consider budget information when setting targets for water saving and water quality. The budget required to plan, construct and maintain any on-ground works as set out in the Strategy was built into Council’s 10 year capital works budget. Council adopted a transparent approach when developing the Strategy, touching on certain concepts which still needed further research and target setting. This allowed them to produce a more complete document, while acknowledging knowledge gaps. Adopting a range of community engagement initiatives during the development of this strategy allowed the capture of a broad audience. Activities included marketing the strategies at key environmental field days such as ‘Clean Up Australia’ day, and holding a ‘Catching the Rain’ forum, which introduced the principles of IWM to the community. Delivery of the strategy required one dedicated staff member for an average of one day a week for a total of 18 months (approximately $27,000 including on-costs). 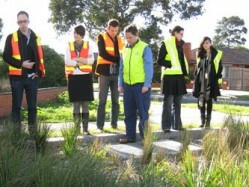 Melbourne Water – Living Rivers contributed $16,780 to the development of the Strategy.